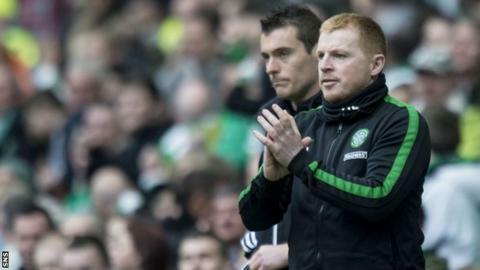 Neil Lennon hailed his Celtic side for their "emphatic" victory over Aberdeen in a pulsating encounter. Scott Brown and Kris Commons both scored a brace and Anthony Stokes was also on target in the 5-2 win. "I'm delighted," said Lennon. "It was emphatic in the end considering we gave Aberdeen a goal. "Going forward, we were fantastic today and could've won by more. It was a good game of football; two teams really going for it." As the domestic season draws to a close, Lennon expressed delight at his side's form. "I'm really pleased with the level of performance that we're showing at the minute," he said. "[Scott Brown's} a fantastic player and he's in fantastic form and he had a great game today. "He really led the team well and deserved those goals. If you look at his record, he should probably weigh in with more goals, but it's a feature of his game he's working on, but his all-round game is very, very good." Lennon was delighted with Commons' contribution as the former Scotland and Derby County midfielder made it 30 goals for the season. "It's an incredible tally. Jamie Langfield made a wonder save from his chip as well, his imagination at times is fantastic, but you always fancy Kris to score - whether it be left or right foot," said Lennon. "He's had a wonderful season and capping it off with 30 goals is terrific. " The Dons felt they should have been awarded a penalty when Jonny Hayes tumbled under Efe Ambrose's challenge. However, Lennon said: "At the time, I didn't think it was, but having seen it again, it looks like Jonny may have gone into him, but I can see why Derek and his backroom staff are upset about it. "I'm not pleased (with the result), I'm delighted. It's more than that. I'm really thrilled with the way we're playing. "I think it's three, six and five we've scored in the last three games when people thought we'd take out foot off the pedal, so it's testament to the professionalism of the players at the moment."